…cultivating community by growing and sharing food… and mulching! “I have really enjoyed volunteering to do some gardening at Vic West’s Community Garden this summer. It was fun to meet and garden with some neighbours. I learned lots about the plants and trees growing there, and enjoyed hanging out with Stephanie and Patti, who are both very knowledgeable about gardening and growing food. Leaf Mulching Volunteer Work Party! Join in anytime between 11am & 3pm, meet fellow neighbourhood gardeners for a big leaf mulching day! We have 20 yards of mulch to spread in Banfield Commons and Banfield Orchard. The worms and soil microbes will thank you! Beverages & light snacks will be provided, as well as pizza for volunteers from Fry’s Bakery. Please bring any extra wheelbarrows, manure/garden forks and hard rakes, as well as your own water bottle and work gloves. Remember to change your clock an hour back the night before. In preparation for mulching the garden beds, we’re looking for keen volunteers to help out with chop n’ drop mulching on Thursday afternoons. Come join the community celebration on Raynor Street with local music, food and fun for the whole family! The corn will be hot and the juice is as local as you can get – pressed from apples harvested by Lifecycles Fruit Tree Project. Build a zucchini car at home or at the event and race it down the new track. Racing all day…vrooom! The Corn Roast is hosted by the Victoria West Community Association, Food Security Collective. Coast Salish Territory … full of trees and water that need protection. Please help any of the trees around you survive this hot, dry summer by giving them water! There are many creative ways to hydrate the landscape. One of our weekly tasks in the Community Gardens is watering the trees and plants that in return give us fresher air, fruit, nuts, mulch, shade and beauty! It’s been a wonderful summer – the community food forests have had some great volunteer help, forming new friendships between people and trees! 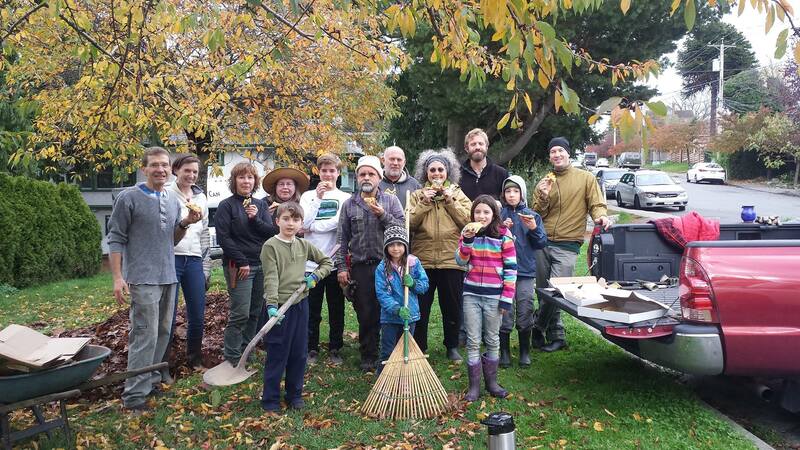 Volunteers are vital to the active stewardship of Banfield Commons Food Forest & Community Orchard, thanks goes out from the Vic West Food Security Collective! Today is Lughnasadh or Lammas – a celebration of the early harvest. A few weeks ago I wrote about how much food to plant to feed your family for a year. This is how it’s starting to pile up. Here’s a look at one bed, and what I harvested today: one savoy cabbage, green and yellow bush beans, the last of the shelling peas, a bowl of basil leaves, purple top globe turnips, yellow, white and green patty pans, two cucumbers, yellow and green zucchini. And some went to the good folks who provide me with growing space. I recently came across an article from RealFarmacy.com that listed what crops to plant and how much of each one would need to feed their family for a whole year. As I have 3 gardens in neighbourhood back yards, I wondered how close I was to feeding myself, so I did a quick count and am amazed at how close I’ve come. Join us on Saturday, May 6th, from 2:00 – 6:00pm for the Vic West Food Security Collective’s Annual Plant Sale. Get your organic tomatoes, squash, basil, cucumbers and many other veggie starts. Come early for the best choice. We’re part of Vic West Fest 2017, which runs from 2:00 until 9:00pm. There’ll be live music, great food, art projects for kids, ice cream, displays, games, and beer for the grown-ups (ID required). Note: new start time for this annual event is 2:00pm. Miner’s lettuce grows in cool, moist places in early spring along the west coast. 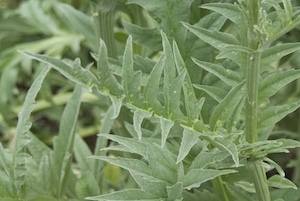 Imagine, a nutritious, yummy green that you don’t need to water or care for, that reseeds itself and is native to this area. It shows up in profusion this time of year when we are desperate for something to add to our salad bowls that hasn’t traveled a thousand miles to get here. 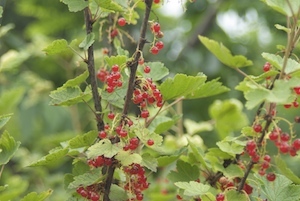 It’s non-invasive, easy to pull when it’s done, and makes great mulch or compost. And chickens who are lucky enough to have it around produce eggs with a deep orange yolk. It’s miner’s lettuce, also know as winter purslane, or Claytonia perfoliata. It tastes like lettuce only earthier, and has a slightly thicker leaf, more like spinach. Some call it a superfood: vitamin C, omega fatty acids and chlorophyll assist with detoxification and blood purification, but I like it because it’s green, available and tastes fresh when most other things don’t this time of year. Miner’s lettuce got its name from the miners of the California gold rush who used it to prevent scurvy. It grows in profusion in moist, shady spots along the west coast right down into California. It doesn’t last long unless the spring is cool and moist, so grab some while you can if you see some!